Just a week to go now before the next Tiree Tech Wave starts, although the first person is coming on Sunday and one person is going to hang on for a while after getting some surfing in. Still plenty of room for anyone who decides to come at the last minute. Things have been a little hectic, as having to do more of the local organisation this time, so running round the island a bit, but really looking forward to when people get here 🙂 Last two times I’ve felt a bit of tension leading up to the event as I feel responsible. It is difficult planning an event and not having a schedule “person A giving talk at 9:30, person B at 10:45”; strangely much harder having nothing, simply trusting that good things will happen. Hopefully this time I now have had enough experience to know that if I just hang back and resist the urge to ‘do something’, then people will start to talk together, work together, make together — I just need to have the confidence to do nothing1. At previous TTW we have had open evenings when people from the local community have come in to see what is being done. 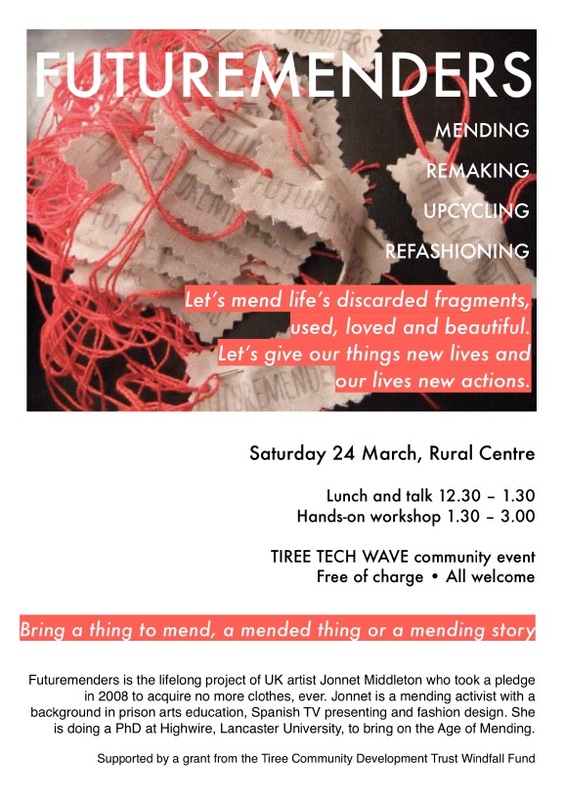 This time, as well as having a general welcome to people to come and see, Jonnet from HighWire at Lancaster is going to run a community workshop on mending based on her personal and PhD work on ‘Futuremenders‘. Central to this is Jonnet’s pledge to not acquire any more clothes, ever, but instead to mend and remake. This picks up on textile themes on the island especially the ‘Rags to Riches Eco-Chic‘ fashion award and community tapestry group, but also Tech Wave themes of making, repurposing and generally taking things to pieces. Jonnet’s work is not techno-fashion (no electroluminescent skirts, or LEDs stitched into your wooly hat), but does use social connections both physical and through the web to create mass participation, including mass panda knitting and an attempt on the world mass darning record. For the past few weeks I have had an unusual (although I hope to become usual) period of relative stability on the island after a previous period of 8 months almost constantly on the move. This has included some data hacking and learning HTML5 for mobile devices (hence some hacker-ish blog posts recently) I hope to finish off one mini-project during the TTW that will be particularly pertinent the weekend the clocks ‘go forward’ an hour for British Summer Time. Will blog if I do. 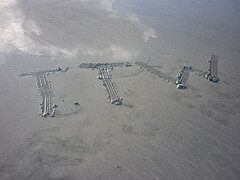 This entry was posted in academic, HCI and usability and tagged arts, design, digital culture, digital media, HCI, philosophy, physicality, Tiree, Tiree Tech Wave by alan. Bookmark the permalink. I’ve just heard about the Tech Wave in a bit more detail from Fiona and would like to come and offer my services. I’m good with, and have, a soldering iron and accessories and quite enjoy making stuff from nowt. If you can let me know what time to be where I’ll ring and book myself on the dial-a-bus. Spinners is our first floor holiday let in Grasmere, Cumbria, furnished with colourful textiles and, naturally, a spinning wheel! It sleeps up to four people in two bedrooms. Contact Good Life Lake District Cottages for information and booking.